Easy Recycling Is Not Effective Enough | HOBI International, Inc. Many enterprises and organizations are kicking off various green initiatives to address the global waste issue. But for years, the easiest green initiative for a majority of Americans has been right from the comfort of their own homes – curbside recycling programs. All one has to do is to separate recyclable materials from non-recyclable waste and place the discarded material in a state-issued bin that will be emptied on designated dates. 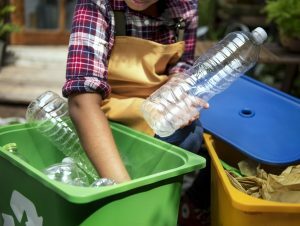 Waste experts call this system of dumping all recyclables into one bin “single-stream recycling,” and while its main benefit is its ease of participation, the growing negative aspect is the amount of non recyclable recyclables, it produces. On average, about 25 percent of the stuff we try to recycle is actually too contaminated to go anywhere but the landfill. The problem has only compounded within the last year when China stopped importing contaminated recyclable material that, in many cases, has not yet found another buyer. Some experts have credited single stream with large increases in the amount of materials recycled. Studies have shown that people choose to put more stuff out on the curb for recycling when they have a single-sort system. In fact, most recycling programs in the U.S. are now single stream. Between 2005 and 2014, these programs went from covering 29 percent of American communities to 80 percent, according to a survey conducted by the American Forest and Paper Association. And the popularity makes sense given that single-stream is convenient and 66 percent of people surveyed by Harris Poll last October said that they wouldn’t recycle at all if it wasn’t easy to do. This is where we run into an issue. While growth of single-stream recycling tracks with the growth of recycling overall in the U.S., it also closely tracks with skyrocketing contamination rates. This means that we’re tossing things in the recycling bin that can be recycled but not through a curbside program or should have gone in the trash can to begin in. The National Waste and Recycling Association comment that the some of the most common items that shouldn’t be in the recycling bin, but nonetheless end up there, are: diapers, electronics, batteries, plastic grocery bags and Christmas lights. These items can be recycled, but only through specialty drop-off programs. Then there are perfectly recyclable cans and paper items that often get coated in food, grease or cleaning fluids, which render them non recyclable. It’s a Catch-22. To get more efficient in recycling, we’d have to ditch the simple and convenient single-stream recycling method, which will likely result in a lack of participation – and not recycling means that our waste crisis will continue to rise. Part of what made single-stream recycling such a good deal was the Chinese market for contaminated recycling. Without that, more potentially recyclable items are ending up in the trash and the economic picture has changed. Single-stream isn’t the only cause of higher contamination rates. New kinds of plastic that clog up recycling machines also play a role, Lee said, and so does our love affair with Amazon — and the resulting increase in recycled cardboard boxes contaminated by various tapes, glues and inks. But it’s a big factor. And with China no longer buying — and other countries considering similar restrictions — we’re going to have to make our recycling cleaner. That means either less single-stream recycling or more public education and more stringent use of single-stream systems. Either way, you can expect recycling to get at least a little less convenient.